I really enjoyed this first one, I used my new hexagon background and die cut! 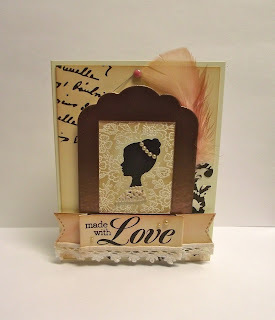 This one is VERY different then what I usually do but when I thought of lace; my English grandmother came to mind :) She had these antique family portraits with bronze frames, so that was my inspiration. I love your hexagon card, Kim! Its just gorgeous!